Collaboration with Kaikatei famously known for Sichuan cuisine. Put Rice(additional 200yen) and homemade plum(100yen) into the soup and they are great match. The soup has distinct taste of wild caught ayu with ayu fillet and ayu fish In it. Origninal curry with old time spicy taste with wild caught ayu soy sauce (fermented 2 years). Please eat it with salad blended with yogurt and urezushi rice (urezushi is a fermented sushi). Ayu Uruka (Sweetfish Shiokara intestine) and original Uruka(Intestine) made with Hakusenshuzou mirin. Sausage suffed with wild caught Ayu Urezushi Rice blended with Gifu produced beef. Collaboration with Metsugerai Tokiwa (Seki city) and Izumiya (Kawaracho). Precious Dojo that lives only in a clean river in a mountain in Gifu prefecture. (Fishing is allowed once every two year in Gujo, Nagara river.) This Dojo feed on seaweed that grows in river and does not smell like mud like other Dojo. It is delicious with rich and noutrious taste. Fermented food using only Ayu, salt, rice(more than 1 year aged). Fermenting sugi basket located at the front is used. It is prepared using the same method with Funasushi in Shiga pregecture, but it is more mild and tasty with Umami coming from Ayu with eggs. Shiokara using Ayu's intestine pickled with salt. Ayu's distinct bitter taste is what is known for. Salt fermented Ayu intenstine. Shibu Uruka(only intestine), Mako uruka(Ovary), Shirako Uruka(testicle). 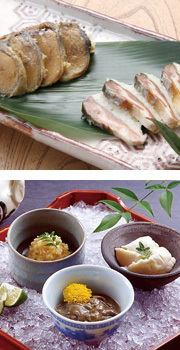 Enjoy rich taste of wild caught ayu.